We have been harvesting HUGE zucchini from our garden this year. 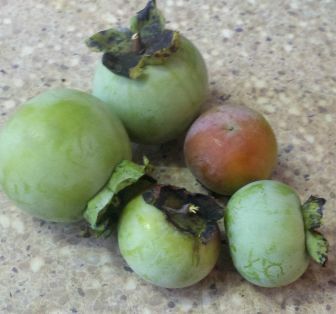 It is the end of August and my hubby is still bringing in a few of them a day. There is only so much you can eat before it seems to be coming out of your ears. What to do with it all you may ask? You can make Parmesan Zucchini; Zucchini bread; Zucchini sticks or you can dehydrate it and make Salt & Vinegar Zucchini Chips, or dehydrate it for future use in cubes or by shredding it. 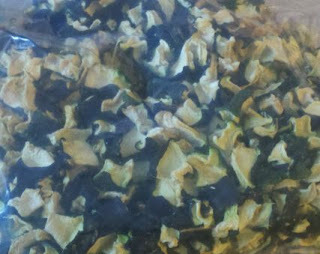 Today, I'm going to show you how to dehydrate the cubed zucchini. First, wash your zucchini and cut off the ends. Slice the ends off the zucchi. 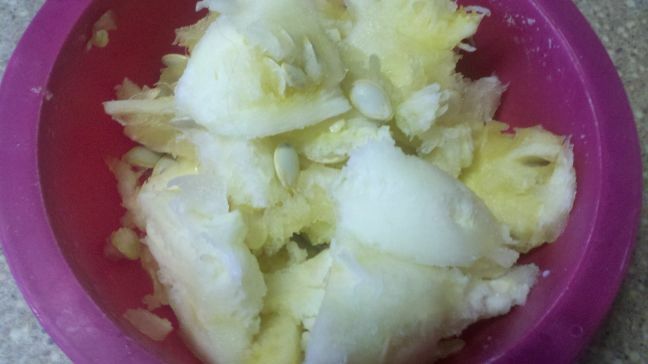 Now, cut the zucchini in half and scoop out the seeds and stuff. We feed this too our chickens. A bowl full of zucchini "pulp" and seeds for our chickens. Now, start cutting the zucchini into cubes. Once it is all cut up, place in your dehydrator for about 12 hours. I just start mine before I go to bed and after my morning coffee, they are done. Use the dehydrated zucchini in soups, stews, or casseroles. 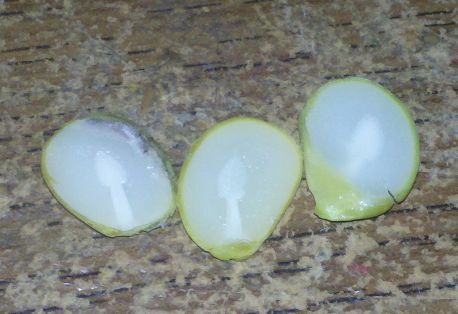 You can rehydrate them first (15 minute soak in hot water) or just throw them in dry into the soup or whatever and they cook up just fine. I have worked out a meal schedule for the month of September. I have created my grocery list and to feed our family, the cost of the groceries will be right at $300. People have asked for my list so I am sharing it with you. If a breakfast is not listed for a particular day than that days breakfast will consist of eggs (we have our own chickens), instant oatmeal or cereal. For lunches, we serve left overs or sandwiches. We drink milk, tea, coffee or water with our meals. I spend $300 a month on groceries to feed our family. Yes, we repeat a lot of meals but we like them and we do not mind. September 1st: Doing a breakfast for supper meal and having Biscuits and Gravy and sausage patties. September 2nd: Pancakes for breakfast; Refried bean & Rice Burritos with beans and rice on the side for supper. September 3rd: Garlic & Soy Chicken quarters and veggies for supper. Chocolate chip & oatmeal cookies as a snack. September 4th: Pancakes for breakfast; Beans & cornbread for supper. September 5th: Homemade pizzas for supper. Homemade Reeses for a snack. September 6th: Biscuits and chocolate gravy for breakfast. Refried bean & Rice Burritos with beans and rice on the side for supper. September 7th: Chicken pot pie for supper. Pound cake for dessert. September 8th: Pancakes for breakfast. Doing a breakfast for supper meal and having Biscuits and Gravy and sausage patties. 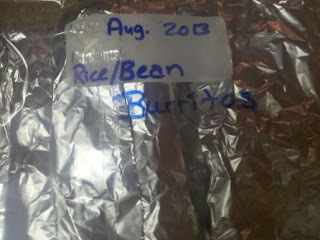 September 9th: Refried bean & Rice Burritos with beans and rice on the side for supper. Chocolate chip & oatmeal cookies as a snack. September 10th: Garlic & Soy Chicken quarters and veggies for supper. September 11th: French Toast Casserole for breakfast. Beans & cornbread for supper. September 12th. Homemade pizzas for supper. Homemade Reeses for a snack. September 13th: Biscuits and chocolate gravy for breakfast. Refried bean & Rice Burritos with beans and rice on the side for supper. 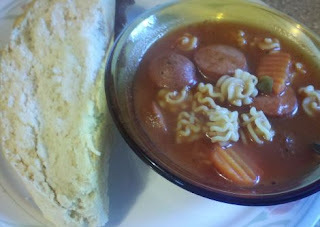 September 14th: Sausage & Radiatore soup with homemade bread for supper. September 15th: Beans & cornbread for supper. September 16th: Doing a breakfast for supper meal and having Biscuits and Gravy and sausage patties. Chocolate chip & oatmeal cookies as a snack. September 17th: Pancakes for breakfast. Hamburger slop for supper (hamburger, tomatoes, beans and rice combined). September 18th: Biscuits and chocolate gravy for breakfast. Refried bean & Rice Burritos with beans and rice on the side for supper. September 19th: Chicken and dumplings for supper. Homemade Reeses for a snack. 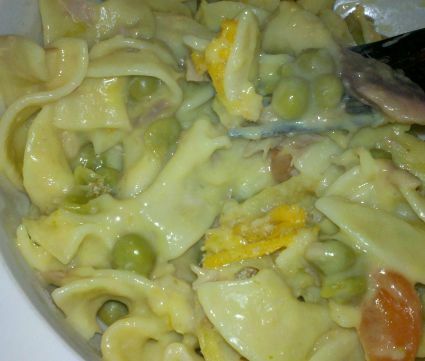 September 20th: Tuna noodle casserole for supper. Pound cake for dessert. September 21st: Mini Frittatas for breakfast. Roast, potatoes and carrots for supper. September 22nd: Chicken and Dumplings for supper. September 23rd: Pancakes for breakfast. Refried bean & Rice Burritos with beans and rice on the side for supper. September 24th: Barbecue chicken quarters and veggies for supper. Chocolate chip & oatmeal cookies for a snack. September 25th: Beans & cornbread for supper. September 26th: Biscuits and chocolate gravy for breakfast. Homemade pizzas for supper. September 27th: Doing a breakfast for supper meal and having Biscuits and Gravy and sausage patties. Homemade Reeses as a snack. September 28th: Pancakes for breakfast. Jambalaya for supper. September 29th: Hamburger slop for supper. September 30th: Tuna Noodle Casserole for supper. As I stated in yesterday's post, I cook a lot of beans and rice. 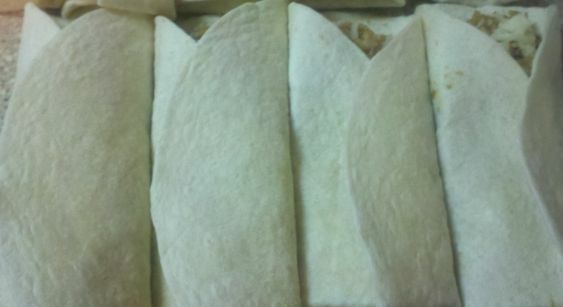 One way we utilize them is by making homemade burritos. These taste sooo good and are easy to make. 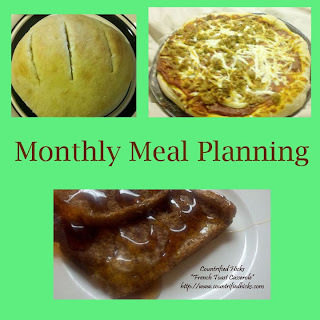 You can either buy some refried beans or use my recipe. If you use the recipe I have, there will be enough refried beans to make 10 decent sized burritos and enough left over for 3 servings of refried beans to eat as a side dish. Get a small pot and add 2 cups of water and add the uncooked rice to the water. Bring it to a boil and then stir in the taco seasoning. Turn the heat low, cover, and simmer for 15 minutes. Once the rice is done, you are ready to put together your burritos. 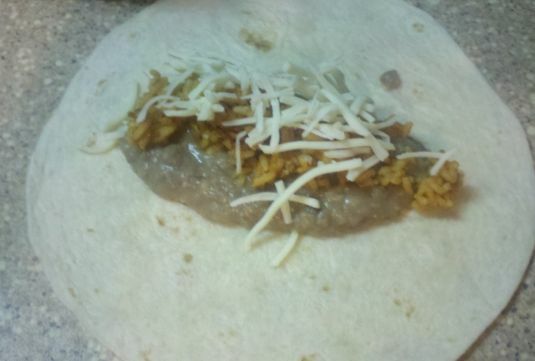 For each burrito, spoon two spoonfuls of refried beans into the center of the tortilla, then the same amount of rice on top and then sprinkle it with cheese. Roll up and either heat and eat or wrap and foil and freeze. We ate 5 of them and froze 5 of them. To cook them, place them on a cookie sheet in a 350 degree preheated oven for 15 minutes. To freeze the burritos, just wrap each burrito in foil and then place in a freezer bag. To cook from a frozen state, cook in a 350 degree preheated oven for 20 minutes or microwave each one for 3 minutes. One way to save money is to eat a lot of beans and rice. They are a great source of protein, cost very little, are very filling and their are numbers of ways to prepare them. They just make sense! One way we eat beans is to make a bunch of "refried" beans in our crock pot. They are easy to make, taste delicious and freeze well. We eat them as a side dish, put them in a burrito, or make a dip out of them. Rinse your beans and put them in a pot of water and let them soak overnight. The next day, rinse the beans and place them in your crock pot. Add in the water and all other ingredients. Turn the crock pot onto high and let them cook for 2 hours. Stir them and cook another 2 hours. Stir and then turn the crock pot onto low and cook 1 1/2 hours. Now take a potato masher and mash the bean mixture up well and enjoy. We have an abundance of smoke sausage. Walmart carries a brand of smoke sausage for 99 cents. Compared to others ($3.00 or more a package) we stock up on it once a month. Right now, we have 30 packages in our deep freeze. One way we use it in a meal is making a tomato based soup. Following the pasta directions, prepare the radiatore. 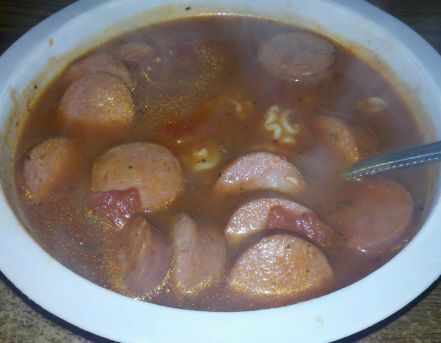 As it cooks, cut up the smoke sausage into slices. In a large soup pot, combine all ingredients and bring to a boil. Once it boils, turn it to simmer and stir in the prepared pasta. Let it simmer for 15 minutes. 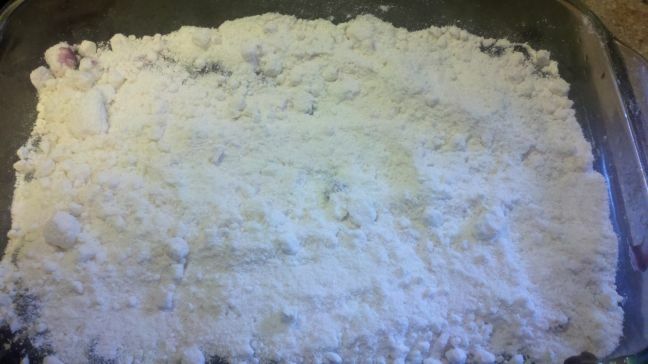 Put into bowls and sprinkle with some Parmesan cheese. Enjoy with a loaf of fresh made bread. We always harvest a lot of zucchini from our garden. 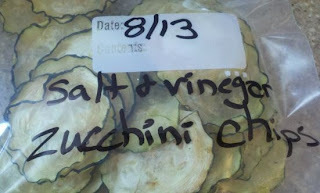 One of the ways we preserve the harvest is by making zucchini chips. Today we made "Salt & Vinegar flavored Zucchini Chips". If you like the Salt & Vinegar potato chips, then you will like these too. I used one large zucchini from the garden. I washed the zucchini thoroughly and then cut off the ends. The zucchini with the ends cut off. 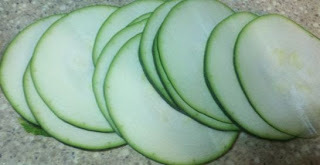 Using my mandolin, I cut the zucchini chips using the medium slice sized wedge (about 1/8" thick). 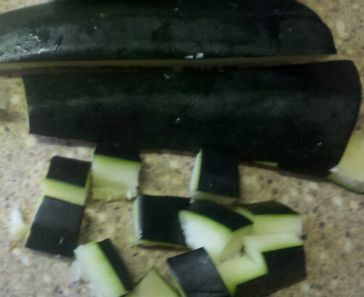 Zucchini sliced by my mandolin. Next, I poured some apple cider vinegar into a container and dipped each zucchini slice into the vinegar and then placed it onto a tray in my dehydrator. Once a tray is full, just sprinkle each slice with sea salt. One zucchini from my garden filled 8 trays up. Turn on the dehydrator and let it dehydrate about 12 hours. I put mine on overnight. The next day you have crisp and delicious chips. The chips, all bagged up and ready to eat! I like easy. Easy is wonderful. If you have a full life like I do, you do not always have time to do everything from scratch but you still want to bake for your family. Here is one of those recipes that will make your family feel special and tastes delicious. 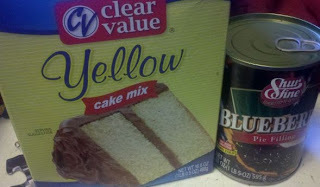 The cake mix and can of blueberries. Preheat your oven to 350 degrees. Spray a 9 x 13 cake pan with cooking spray. Open up the pie filling and pour into the pan. (You can use frozen blueberries instead.) Pour the dry cake mix on top of the blueberries. The dry cake mix on top of the blueberries. 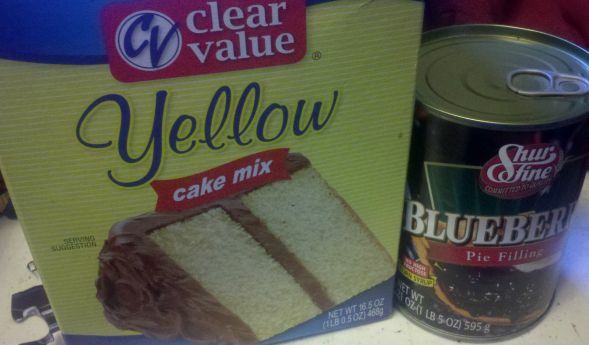 Now slowly pour the soda pop over the top of the dry cake mix. That's it. Ready to go into the oven now. Now, just put it into the oven and bake for 48 minutes. Easy-peasy! Another super simple recipe is my Super Easy Apple Pie with just 2 ingredients. Nine years ago, God blessed our family with another little boy. It was one of the happiest days of my life but only very briefly, and it was almost one of the saddest days of my life. Ronny almost died on the day he was born. I never want to experience that kind of pain again. But here we are 9 years later and life has been full of laughter and love. Here is the birth story of Ronny. 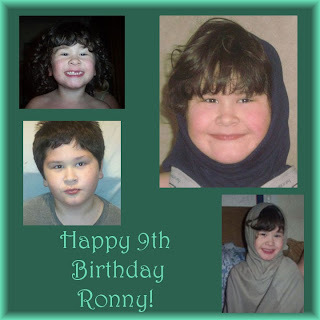 Please pray for Ronny today when you say your prayers. Pray that God will rain His blessings down upon him. Be sure to check out updates about my book writing! As many of you know, I recently went on a trip to visit my daughter and to be there for the birth of my 3rd grand child. 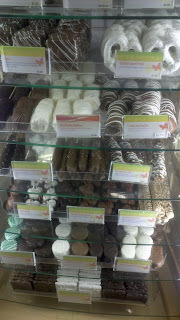 While there, I had the pleasure of visiting the "Rocky Mountain Chocolate Factory" in Stillwater, OK. When I say "pleasure", boy howdy, do I mean it. Not only is the place a feast for the mouth but also for the eyes. It is AMAZING!!!! My son Ronny sitting out front of the store with the store mascot. The store is owned by Janna Boyer and is family operated, in fact, Janna's daughter is the manager. All of the employees are so friendly that you just feel at home while browsing all the goodies available. 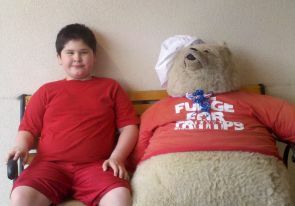 You will find the mascot bear and the employees wearing the red "Fudge for Troops" t-shirts and they are doing so for a great cause. For every pound of fudge you buy during July and August, Janna will donate and send one pound of fudge overseas to our troops. She has been doing this for the last four years and so far, has sent over 750 lbs. of fudge to Afghanistan, Kuwait, etc. I know that chocolate is usually discouraged to be sent because of the heat but the workers at the Chocolate Factory make their own inverted sugar from scratch at the store and it keeps the fudge from melting. How great is that?! They even make their own caramel right there in the store too. By the way, the store carries 8 different varieties of fudge all the time but during the holidays, they have even more flavors than that. 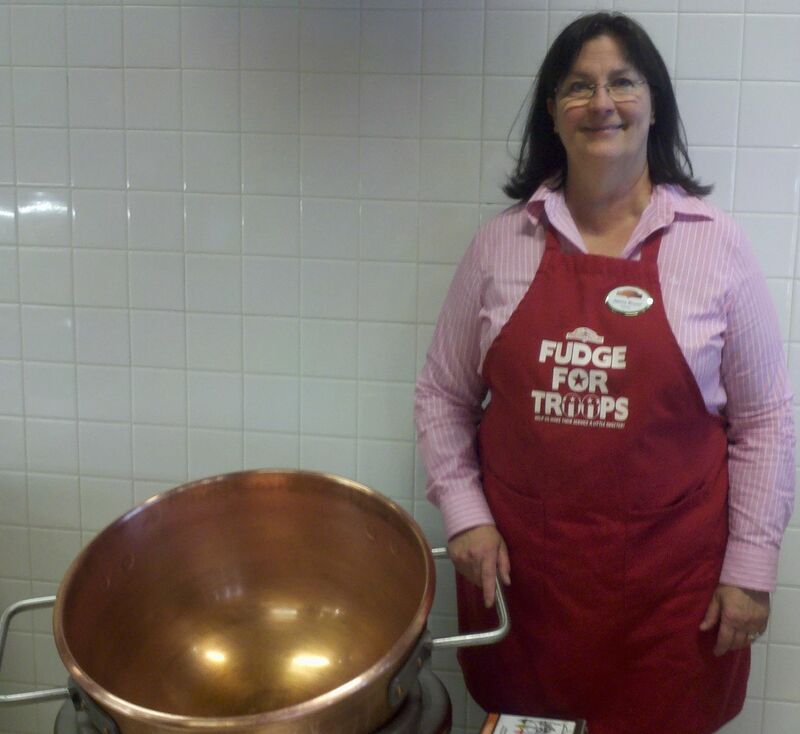 The store owner, Janna Boyer, standing next to the copper pot they use for making fudge. 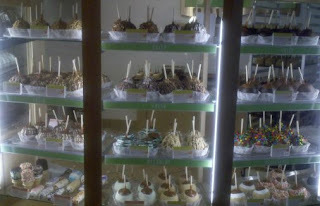 The store carries over 25 different flavors of caramel apples at a time. Some of the flavors include: English Toffee, Apple Pie Apple, Pecan Apple Pie; Triple Chocolate, Worms & Dirt apple, and Pecan Bear Apple (which is a caramel pecan apple wrapped in chocolate). The apples are reasonably priced from $4.50-$7.50 each. I got the Triple Chocolate apple and it was DIVINE! Glass cases full of delicious yumminess. 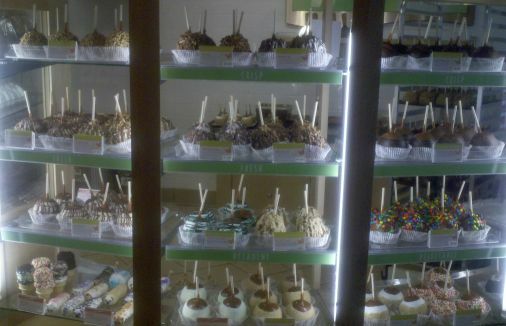 Some of the different varieties of caramel apples they carry. They specialize in marshmallow creations too. 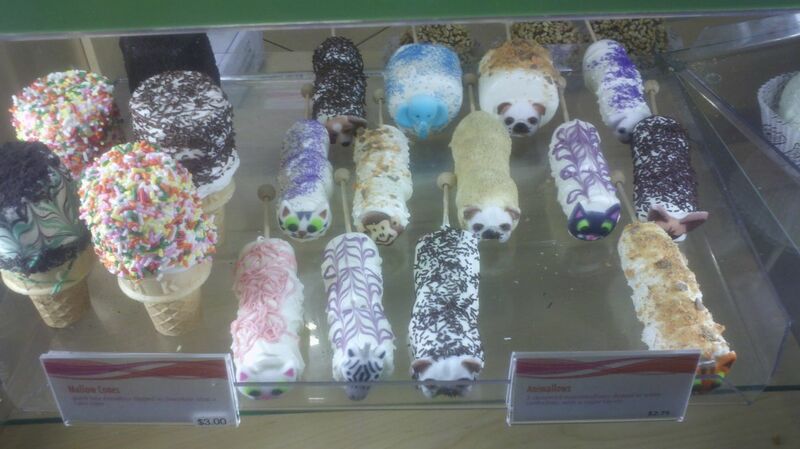 They make marshmallow cones, marshmallow animals, and dipped marshmallows. Marshmallow cones and "Animallows". Cute, huh? They have a variety of pretzels including: Chocolate; Chocolate Marshmallow; Rice Crispy; Oreo Cookie; and Nutter Butter pretzels. They also have pretzel rods that include one with sea salt. Yum! While we were enjoying our apples and chocolate covered strawberries, we sipped on delicious iced tea and their famous Root Beer Floats. It was quite a day and one we won't soon forget. 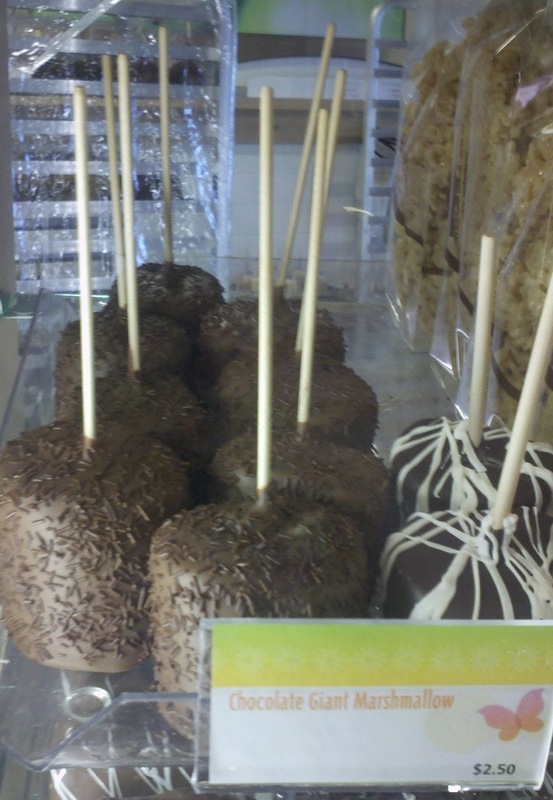 If you are ever within driving distance (even 4 hours away), it would be worth your time to drop by The Rocky Mountain Chocolate Factory in Stillwater, OK (714 S. Main) and try out some of the wonderful treats. Or if it is too far, call the store (405-533- 2977 or 405-385-9655) and place and order and Janna will mail it right out to you! Store hours are Monday-Saturday from 10 a.m.- 9 p.m. and Sundays 1 p.m. - 9 p.m.
Tuna noodle casserole is one of those easy-to-make, inexpensive, yummy meals. We have this about 2-3 times a month and is always a big hit. Preheat your oven to 425 degrees. Spray a 9" x 13" cake pan with cooking spray and set aside. Bring a large pot of water to boil. Once it boils, stir in the bag of egg noodles and the sliced carrots and let them boil for 5 minutes. Drain and return the noodles to the pot. 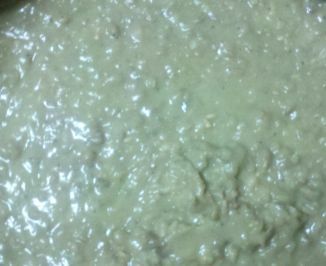 Now, stir in the can of peas, onions, 1 cup of the cheese, tuna, soups, milk, salt and pepper. Stir well. 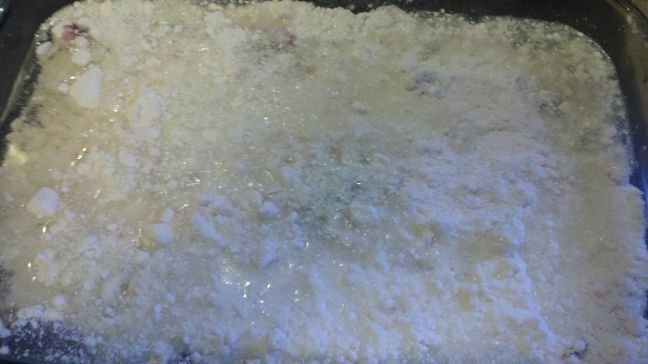 Pour the mixture into the prepared cake pan and bake for 25 minutes. Carefully remove the pan from the oven and sprinkle on the remainder of the cheese and the crushed cornflakes. Bake for an additional 5 minutes.